Over the years, many studies have focused on how important sleep is for growing children and adolescents. Some advocates have even gone as far as suggesting that schools start later in the morning to give students extra time to sleep. But a recent study shows that parents are pretty divided on that course of action. A nationally representative survey conducted by researchers at the University of Michigan shows that only 51% of parents support delaying school start-up times. However, the results reveal that many of these respondents are unaware of how much sleep their children should be getting. "We found that parents underestimated how much sleep their children needed, and only about half agreed with existing recommendations that school start times should be later," said lead researcher Dr. Galit Dunietz. The survey was administered to 554 parents with teens between the ages of 13 and 17, all of whom started school before 8:30 a.m. According to the results, many of these caregivers believed that middle- and high-school students needed only seven hours of sleep per night to function properly. However, recommendations from the American Academy of Sleep Medicine state that teens in this age range should get 8-10 hours of sleep per night, and that current school start-up times are causing sleep-related problems. "If their bodies don't tell them they're tired until 11 p.m. or later and then they have to be at school before 7:30 a.m., many of these teens experience a chronic sleep debt," says Dunietz. "Many teens would do fine if they could go to bed late and sleep late in the morning. But they can be late to school or become chronically sleep-deprived when classes start early every weekday," adds senior author and neurologist Dr. Ronald Chervin. Despite these shortcomings, nearly half of all parents in the survey opposed starting school at a later time. When asked for the reasoning behind their answers, many cited logistical concerns, such as transportation issues, adjustments to meal times, and the timing of after-school activities. However, the researchers point out that schools who have pushed back start times have seen no real negative effect resulting from the decision. 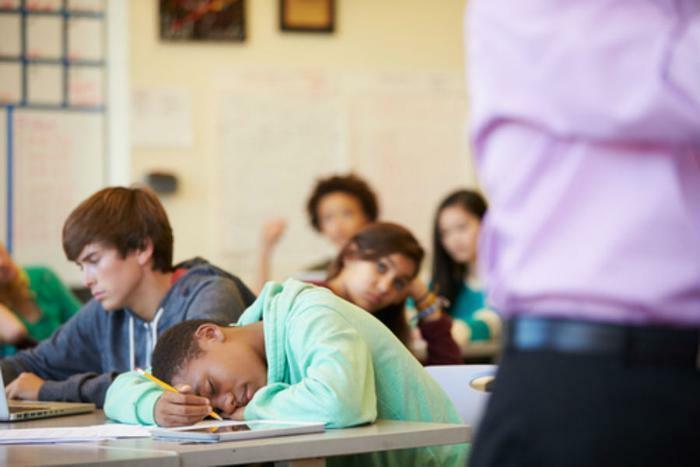 Experts report that students are often much less tired in the classroom, and that the change could reduce the chance of mood disorders, obesity, and risky behaviors. "There's evidence that it's a win-win for everyone," says Dunietz. "We cannot change teens' biology to have them sleep earlier, so we should push the school start times back, in line with recommendations from the American Academy of Sleep Medicine and the American Academy of Pediatrics." The full study has been published in the Journal of Clinical Sleep Medicine.